Superdry men’s snow pant. These innovate snow pants are a must-have on the slopes this season. 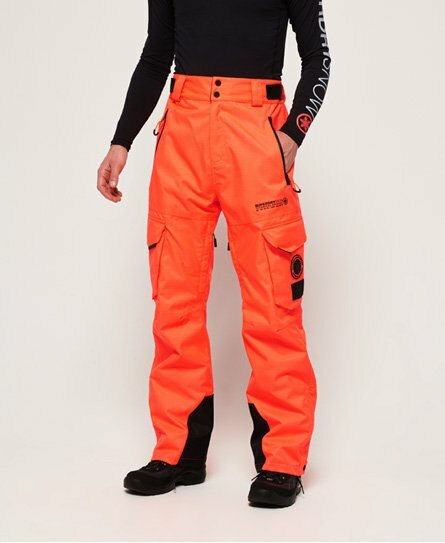 These snow pants come with a zip and popper fastening, hook and loop waist adjuster straps and leg length adjusters in the pockets for a personalised fit. These pants feature coated zips and fully taped seams and thigh vents to keep you comfortable. These pants also feature zipped hems with boot gaiters and boot clips. The snow pants have been designed with a light insulation rating, with reinforced panelling and ergonomic adjusters throughout. For practicality, these snow pants features two front zip pockets, two back pockets with a hook and loop fastening and four handy thigh pockets. The Snow pants are finished with branded zip pulls and poppers, a Superdry Snow logo on the upper thigh, two Superdry snow badges on the thigh pocket, Japanese inspired logo tab on each pocket and a Japanese inspired logo on the back of the leg.